Aqua Flash heads a field of 10 2-year-olds entered back in Saturday’s 350-yard, $62,190 John Deere Prairie Meadows Juvenile Challenge Stakes. ALTOONA, IA—SEPTEMBER 13, 2018—Thomas J. Scheckel’s Aqua Flash heads a field of 10 2-year-olds entered back in Saturday’s 350-yard, $62,190 John Deere Prairie Meadows Juvenile Challenge Stakes. The fastest qualifier, Aqua Flash made her local debut with a half-length victory as the 3-5 favorite in the first of two trials on September 1. 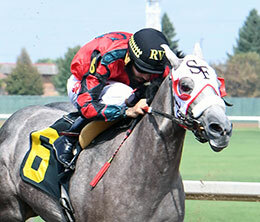 The gray daughter of champion First Moonflash has earned $74,645 from four starts, and she was a finalist in the June 2, $1.025-million Heritage Place Futurity (G1) at Remington Park. Aqua Flash drew post 7 and will be ridden by Roberto Valero for trainer Shawna Manriquez. Also on Saturday, George L. Seward’s Vallero drew post 7 for the 400-yard, $54,270 Adequan Prairie Meadows Derby Challenge. Trained by John Hammes, Vallero has earned $46,387 from nine races, and his three wins include a half-length score as the 7-10 favorite in last year’s 350-yard, $64,000 John Deere Prairie Meadows Juvenile Challenge. The gelded son of Valiant Hero will be ridden by Alfredo Triana Jr.
All Prairie Meadows races can be seen at Q-RacingVideo.com.